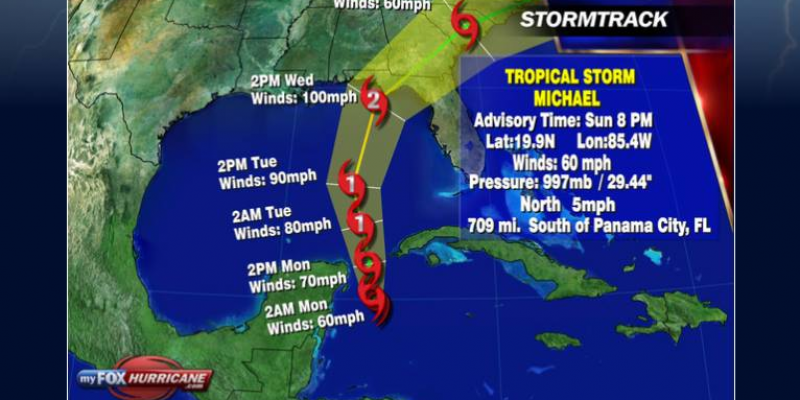 Michael is expected to make landfall in the early hours of Wednesday morning, and currently sits at a category 2 hurricane, gradually strengthening, according to The Weather Channel. There has not been a storm force as powerful as the current one to touch the Florida Panhandle in 13 years, with Hurricane Charley having been the most recent development to reach as a category 4 hurricane. Charley transitioned from a category 2 to a category 4 in a mere matter of hours, making landfall soon after. 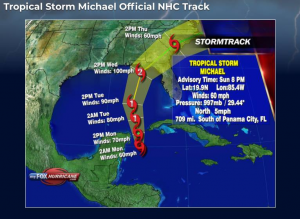 As it moves north, Michael, currently located about 360 miles south of Panama City, will bring with it flooding, heavy winds, and torrential rainfall. The flood waters are expected to rise quickly and soon. Southern portions of Georgia and Alabama are also expected to be affected, although not nearly as detrimentally. Governor Rick Scott declared a state of emergency for the upper region of the state, most recently including Tampa Bay. 35 counties are included in this declaration. “Hurricane Michael is forecast to be the most destructive storm to hit the Florida Panhandle in decades,” he stated, “You cannot hide from storm surge, so … get out if an evacuation is ordered.” The governor called the storm ‘monstrous’, emphasizing the destruction expected to be brought on to the state by the storm. Evacuation is being urged for around 3.7 million Floridians and a further 2 million in the two surrounding states, indicating the sizable range of this storm.